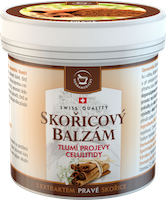 Cinnamon balsam is a unique massage product which helps to attenuate the appearance of cellulite. 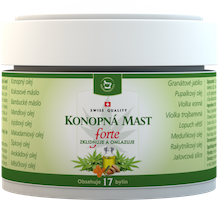 Original formula developed in Switzerland that benefits from the latest advances in phytopharmacy. 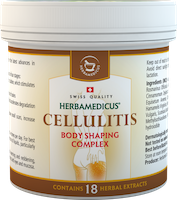 Cellulitis is an excellent natural anti-cellulite complex. 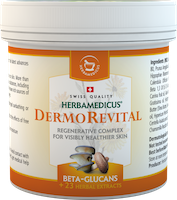 Dermorevital is an active regenerative balm for deep revitalisation of irritated or injured skin. The special combination of herbal extracts and effective active substances contains Oyster Mushroom. Regenerative and soothing milk with a high percentage of panthenol (11%), enriched with a unique herbal complex. Vitamin E is a fat-soluble vitamin and a powerful antioxidant. It is extremely effective in combination with vitamin C. Vitamin E protects our skin from the physical signs of skin aging such as wrinkles and hyperpigmentation. Vitamin E also prevents the breakdown of important protein substances and thus slows the aging process. Beta-glucan is a unique natural complex polysaccharide capable of supporting the body's defence responses against bacterial and parasitic diseases. It has been scientifically proved that beta-glucans improve wound healing in patients after operations and help improve the condition of the body after radiotherapy or chemotherapy. Cinnamon has been known as a spice and a medicinal herb for centuries. It belongs to warming spices that raise the body temperature and improve blood circulation throughout the body. It also improves digestion, i.e. it breaks down fats and has the ability to accelerate metabolic rate. Cinnamon has disinfecting and antibiotic properties. It acts as an antibacterial agent in the body, and because of that it is very helpful in treating a myriad of problems. 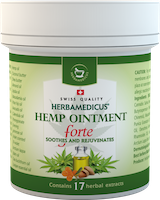 Traditionally, hemp oil is used for atopic care and when treating psoriasis. It takes care of itchy and troublesome skin. It is also suitable for dry and sensitive skin. The oil is rich in unsaturated fatty acids (linoleic, alpha-linolenic and, especially, gamma-linolenic acid). The oil moisturises and regenerates the skin.